Within Arizona’s Tucson Basin is The Saguaro National Park. 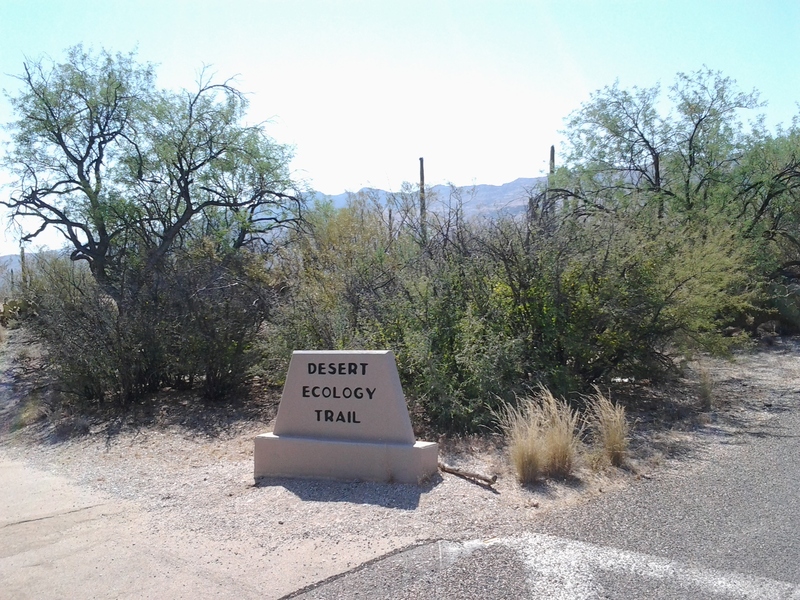 This park provides the ideal conditions for sustaining dense stands of the famous saguaro cactus. **The most important factors for growth are water and temperature. If the elevation is too high, the cold weather and frost can kill the saguaro. 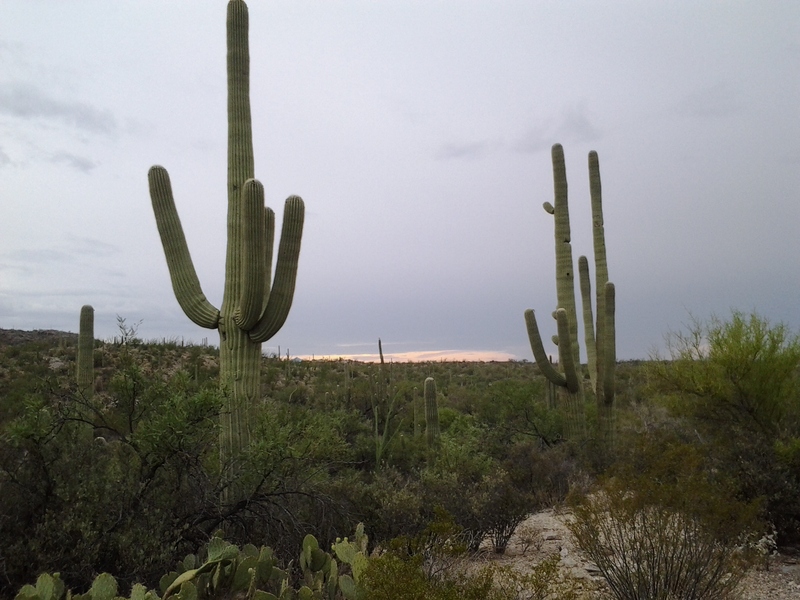 Although the Sonoran Desert experiences both winter and summer rains, studies show that the Saguaro cactus obtains most of its moisture during the summer monsoon season. There are dozens of varieties of cacti; short, tall, stout, delicate but none quite as magnificent as the Giant Saguaro cactus. Saguaros have one deep tap-root but most of this cactus’ roots are 4-6 inches deep and span out as far as the desert plant is tall. The saguaro is the largest cactus in the US. After the saguaro dies its woody ribs can be used to build roofs, fences, and parts of furniture. The Giant Saguaro can live to be 200 years old. 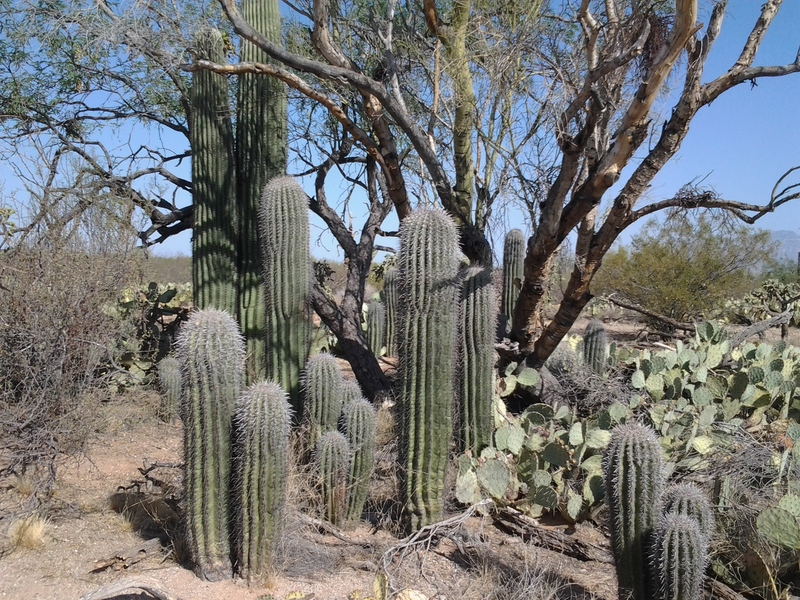 In the Sonoran desert the saguaro cactus has a boundless variety of towering armed shapes. 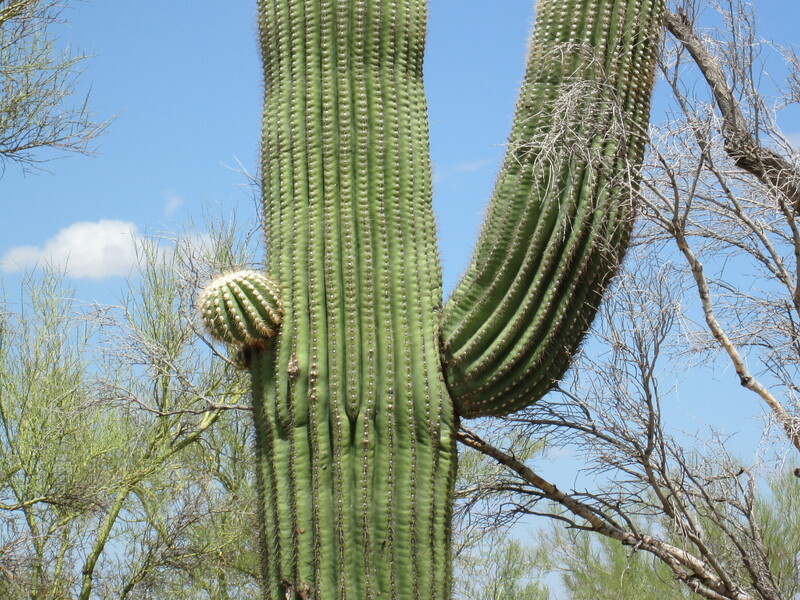 Water makes up 75 to 95 percent of the saguaro cactus’ weight. During periods of drought the pleats of the saguaro cactus contract. During Arizona rains the saguaro expands as it soaks up moisture. 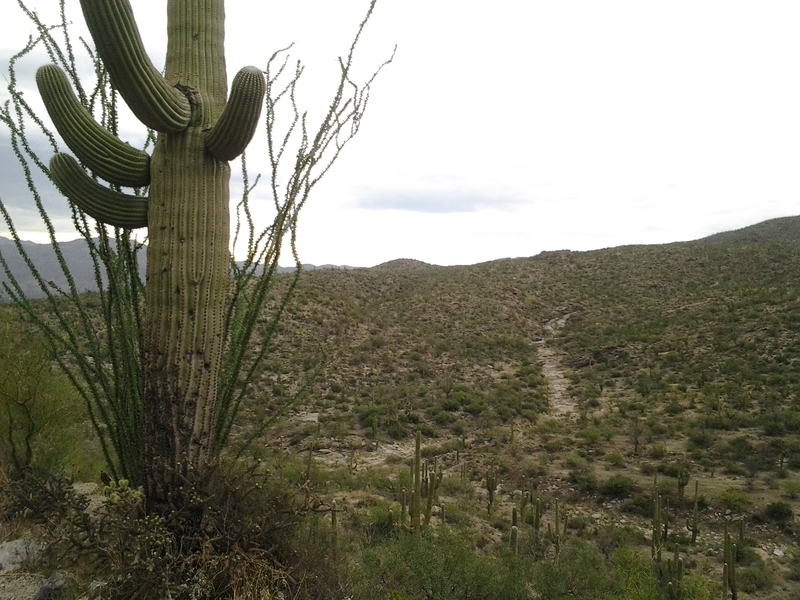 Saguaros, like many desert cacti, grow excruciatingly slow. Arizona cactus experts estimate that a forty-foot tall saguaro is about 150 years old. 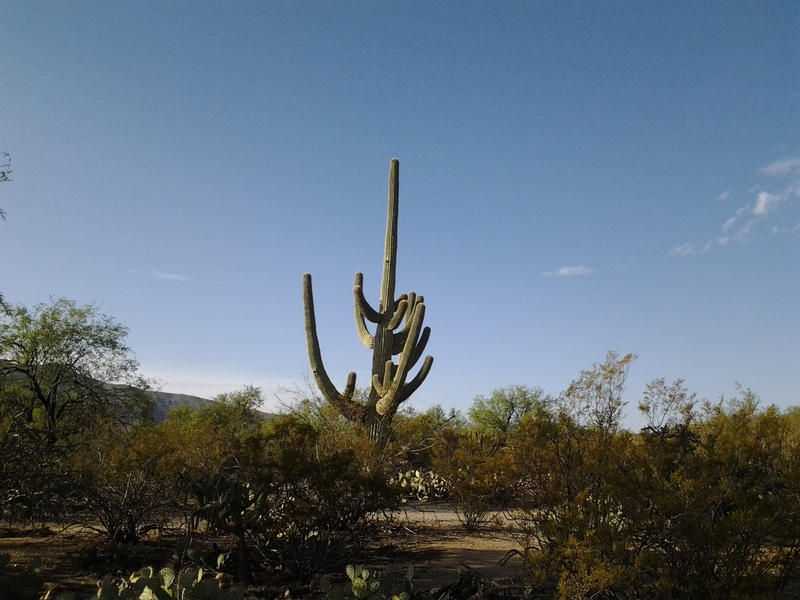 Arm buds begin to appear when the saguaro is 75 years old. 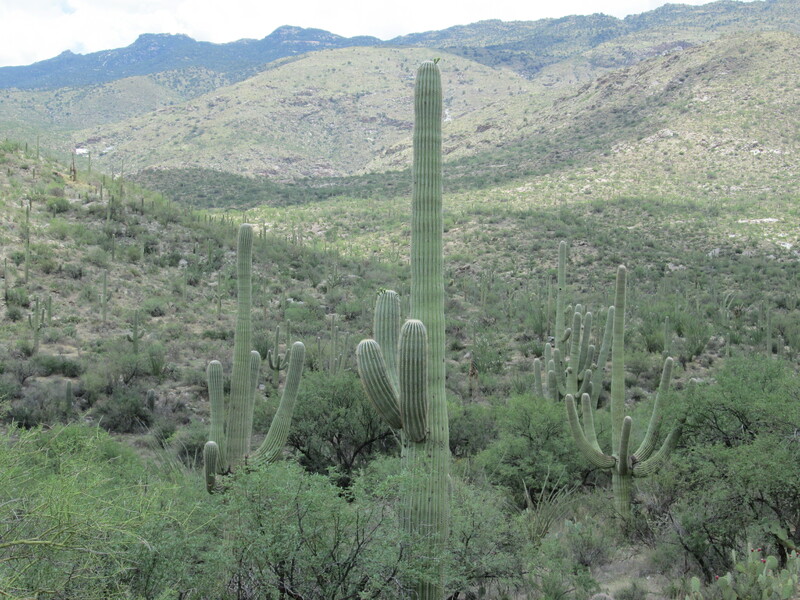 Many saguaros now standing in cactus forests germinated in the mid-1800s !! 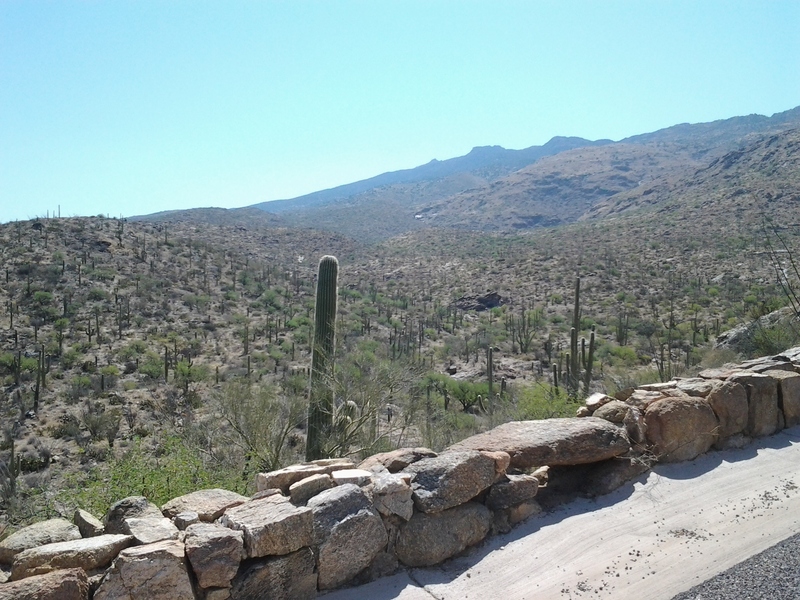 To survive their early years, saguaro seedlings must be sheltered from the elements, whether it be under the canopy of other plants or in the crevices of rocky outcrops. 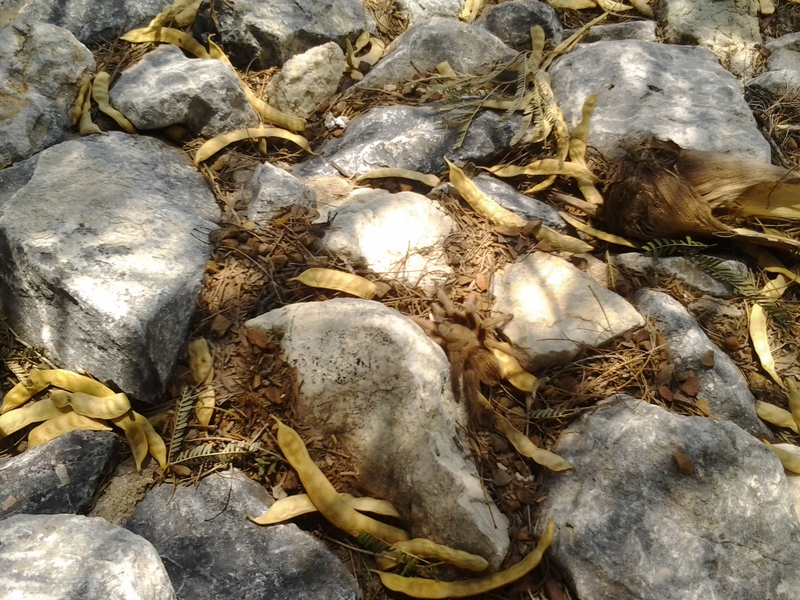 Saguaro seeds can be deposited in droppings of birds roosting on branches of shrubs and trees. 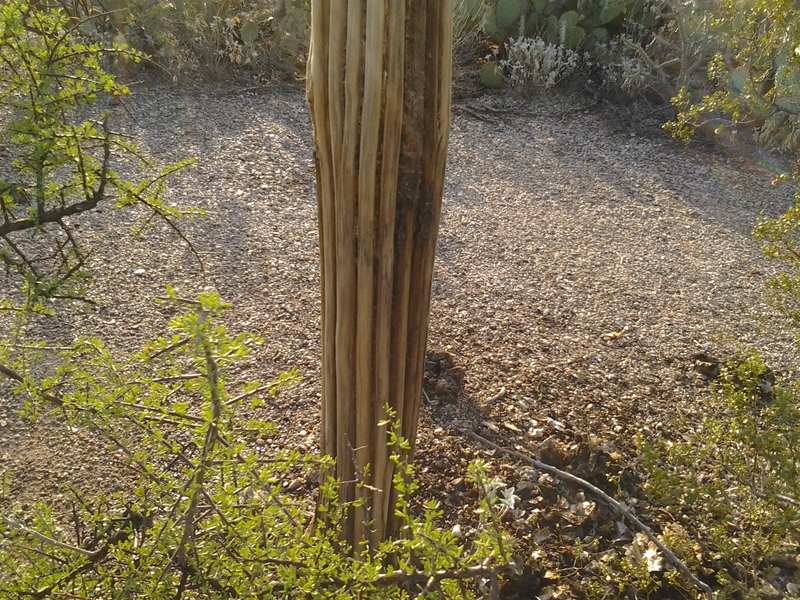 Lightning, powerful winds, harsh winter freezes and the rotting of dead tissue kill saguaros. Their woody ribs stay on the desert floor until they are consumed by termites or decay and return to the soil. This cactus species is not currently listed as threatened or endangered. 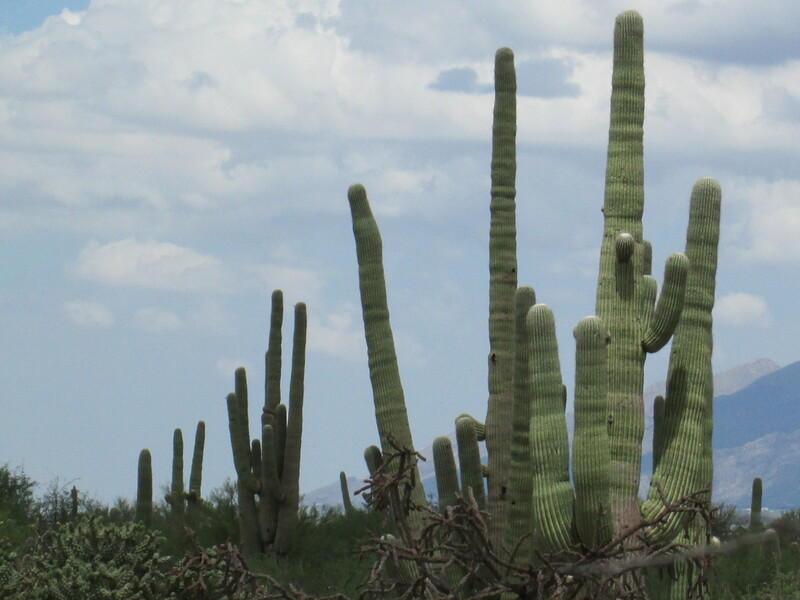 Arizona has strict regulations about the harvesting, collection or destruction of the saguaro cactus. You can find the majestic giant cactus in southern Arizona and western Sonora, Mexica. 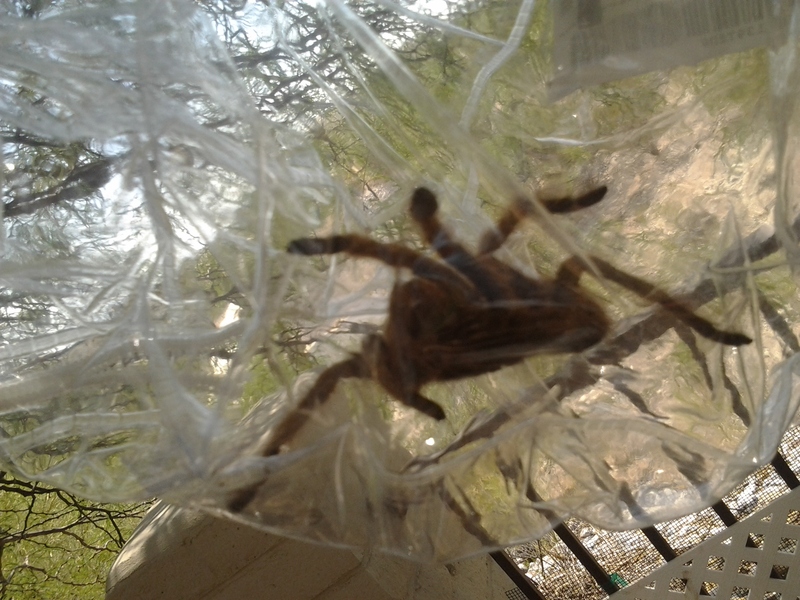 This tenacious pepsis wasp will tap and strum the web at the burrow entrance trying to coax the tarantula out. If the tarantula responds, a long battle will begin! Most often the tarantula hawk wins by delivering a paralyzing sting to the tarantula. 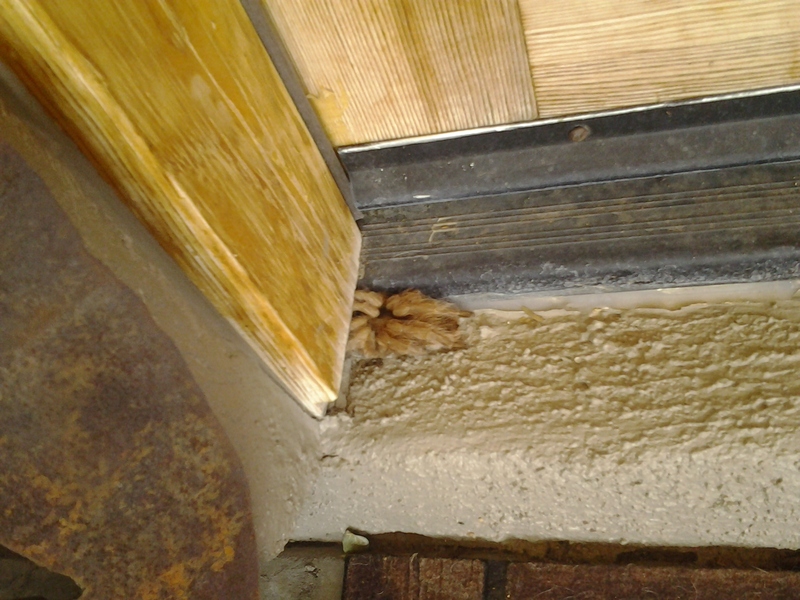 The paralyzed tarantula is dragged to a pre-dug burrow and dropped in by the large female wasp. The tarantula hawk then lays a single egg on the paralyzed tarantula and leaves. The wasp larva will hatch and feed on the tarantula spider. After completing its metamorphosis, in about 3 weeks, the adult pepsis wasp will then dig its way out of the underground burrow and start its life cycle anew. Tarantula Hawks, have the second most painful sting of any insect. Just how painful is the sting of the Tarantula Hawk? The Schmidt Sting Pain Index rates insect stings from 1-4. Africanized bees and hornets register 2. Bullent Ants and Pepsis wasps register 4 !! Only the female Tarantula Hawk stings because the stinger is derived from the ovipositor, the egg-laying organ. In the deserts of the southwestern US two species of Tarantula Hawks are common, pepsis formosa and pepsis thisbe. The most common in Arizona is pepsis formosa wasp with the orange wings. Hundreds of Tarantula Hawk Wasp species exist worldwide. The color of the wings may very from species but the sting of the this killer wasp is described as blinding, fierce, and shockingly electric. Simply unbearable pain, lasting 3 minutes. A long 3 minutes! Not lethal to humans unless you are allergic to pepsis wasps. How to tell the difference between the male and female pepsis wasp? The antennae of the male tarantula hawk is tightly curved while the FEMALE wasp is only SLIGHTLY curved. Tarantula Hawk females grow larger than the males, and can reach up to 3 inches in length. This youtube video is a battle between the Tarantula Hawk and Tarantula Spider. Both female and male pepsis wasps are nectarivorous. The male does not hunt but fills himself with the nectar of plants while watching for female tarantula hawks that are ready to reproduce. Other than Roadrunners and Bullfrogs, most predators avoid the Tarantula Hawk wasp. 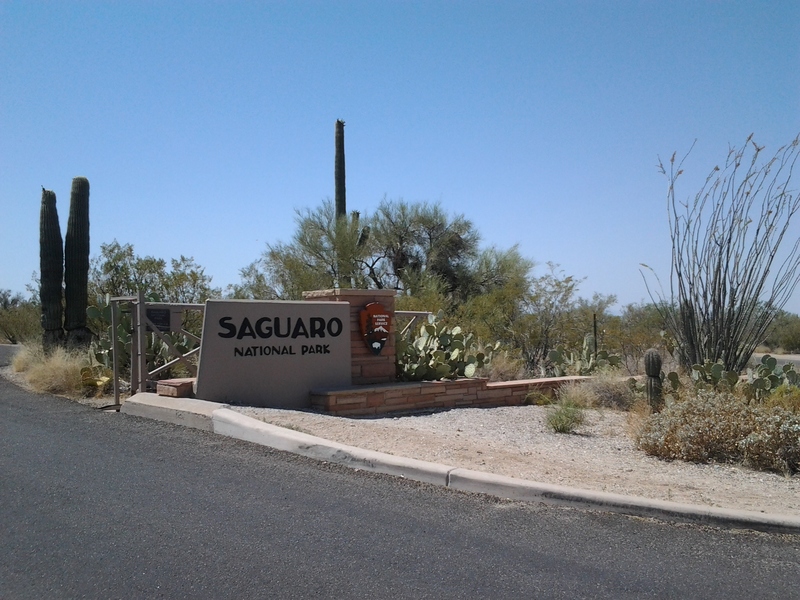 While traveling Arizona we stopped at Saguaro National Park, in Tucson. The park is located in the Sonoran Desert. 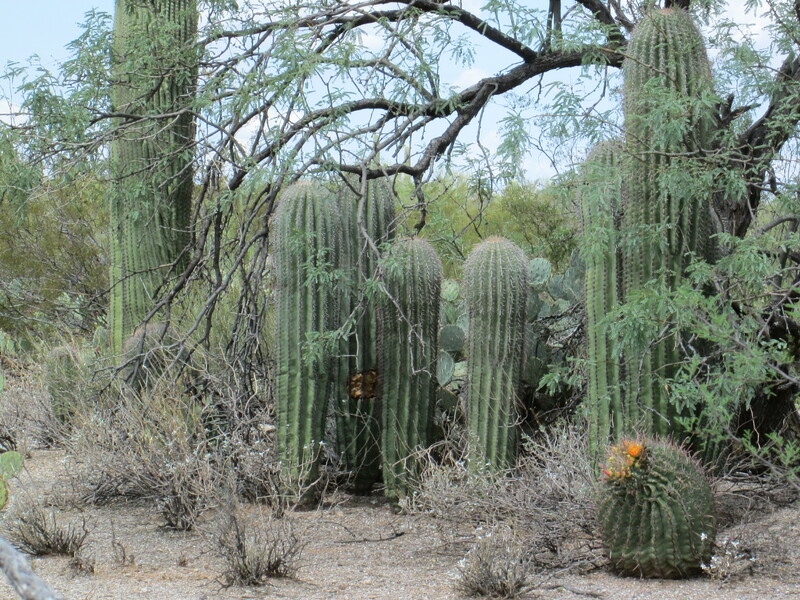 The giant cacti, called Saguaros, are protected and preserved within the park. After a single rainfall, Saguaros can soak up to 200 gallons of water through their huge network of roots that lay just 4-6 inches below the desert surface. That is enough water to last this giant cactus an entire year! A saguaro expands like an accordion when it absorbs water which can increase its weight by up to a ton. In 1931, The Saguaro’s Blossom became the Arizona State Flower. 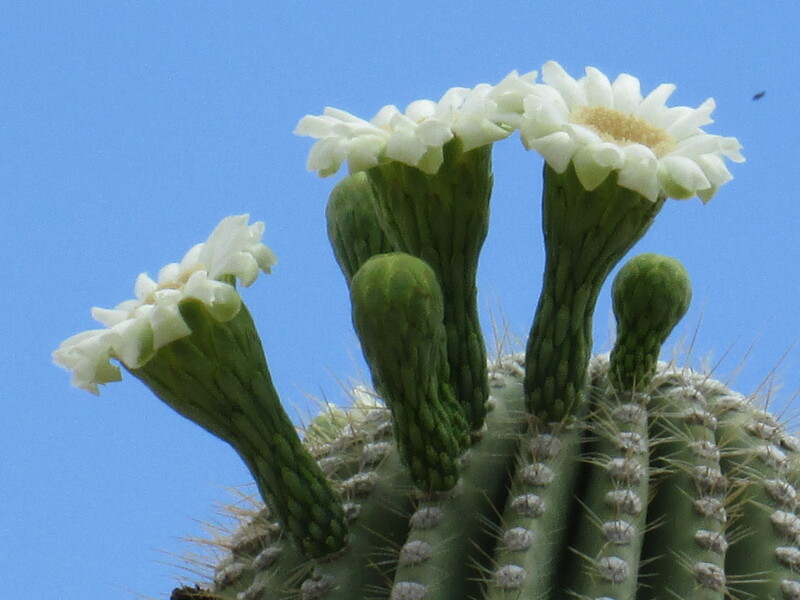 The Saguaro Cactus blooms April through June. Its flowers are creamy white and numerous. 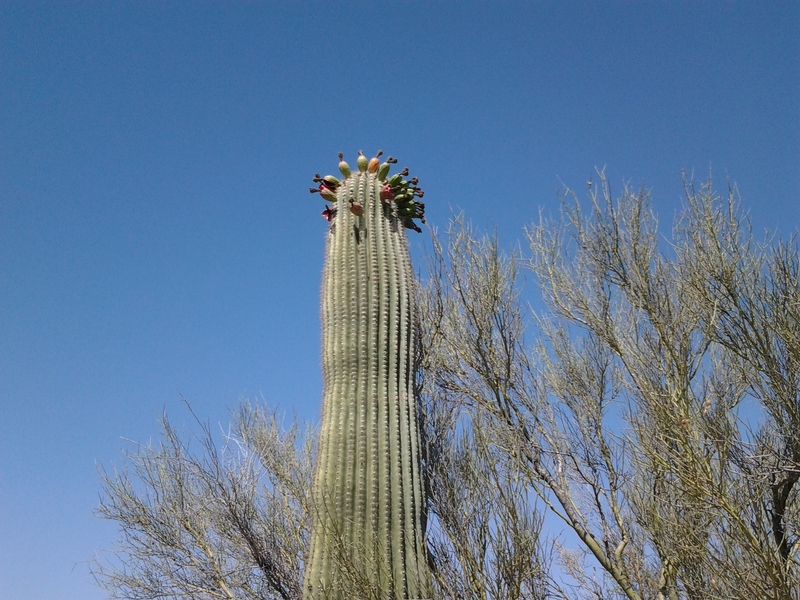 Up to a hundred flowers can bloom on one Saguaro Cactus! The saguaro blossom opens after sunset and by the next afternoon the flower is wilted. The white cactus flower repeats itself night after night. 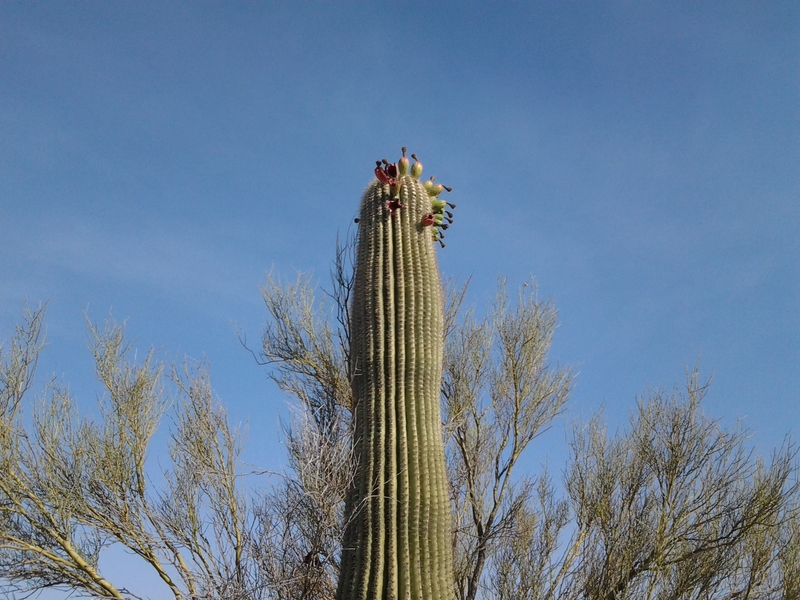 During the few hours the saguaro flower is open birds, bats, and honeybees pollinate them. 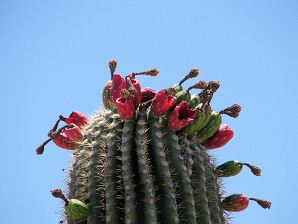 Later in the summer, the cactus flowers that were pollinated will become red-fleshed saguaro fruits that are enjoyed by the local bird population. The saguaro cactus is also known as the pitahaya, sahuara and giant cactus. 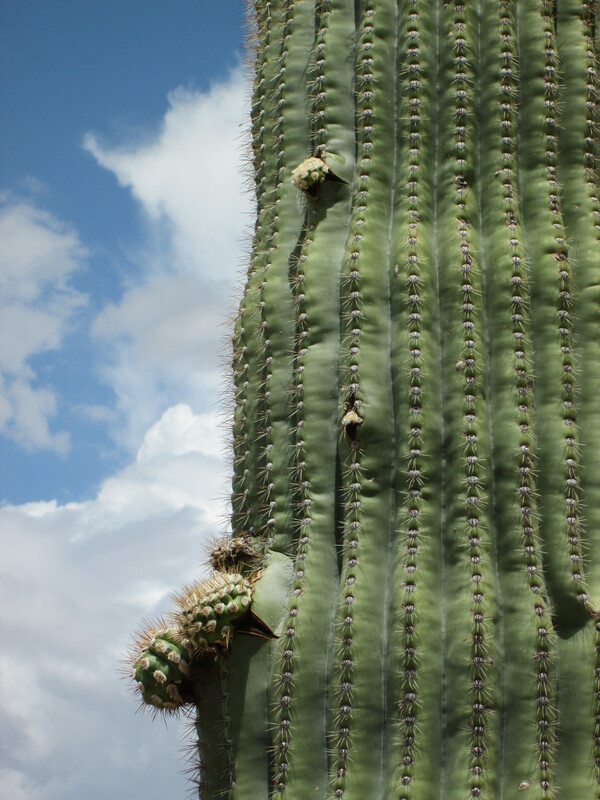 The Saguaro often begins life with a nurse tree or shrub which can provide shade and moisture for the germination of life. This Saguaro grows slowly — only about an inch a year — eventually becoming very tall; reaching heights of 50 feet. The largest saguaro cacti, with more than 5 arms, are approximately 200 years old. Adding splendid color and shapes to your low maintenance garden – Lets start with white and purple flowering shrubs. TEXAS SAGES, Leucophyllums, are among the most reliable and fool-proof of the low water use plants available in Arizona! 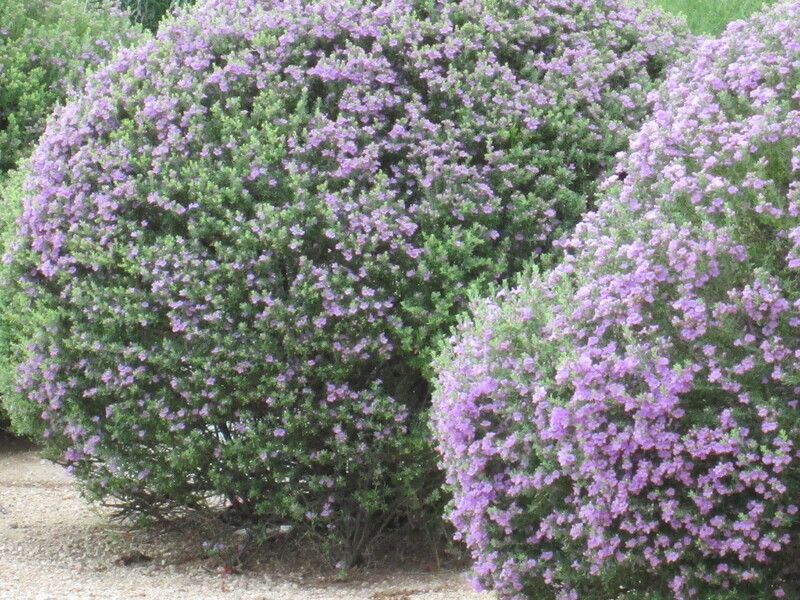 Texas sage bushes have silvery gray leaves and purple or white flowers that bloom from summer through autumn. These sage plants are relatively carefree after they are planted, but good sunlight and proper drainage are essential to the Texas Sages success. 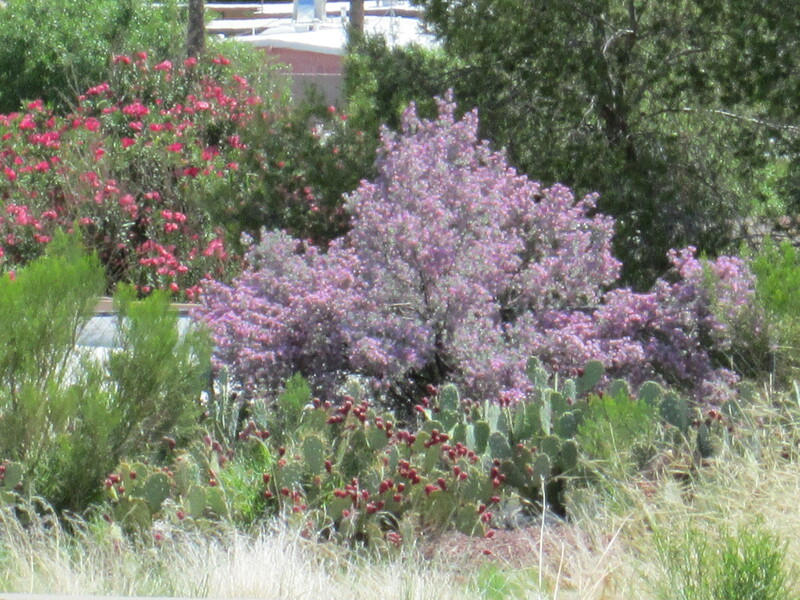 The purple and white flowers look amazing next to a prickley pear cactus. In areas with poor drainage or with high average rainfalls, plant Texas sage brushes in raised beds. The picture above has some of the best ideas for choosing plants with colors and different shapes that can be used in xeriscape or any low care, heat resistant yard. Prickley Pear cactus are unique in gardens and add an architectural flare. In the photo background is a Red Oleander, Nerium oleander, bush. Oleanders make a popular divider or hedge, and can even be trained into a tree. 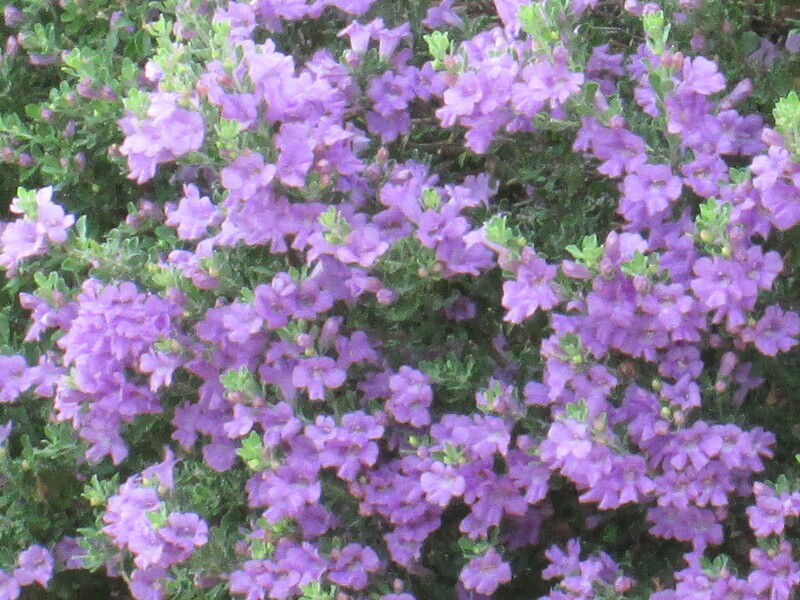 Of course we must mention the ever so popular Purple Texas Sage, also called Texas Ranger Plant. 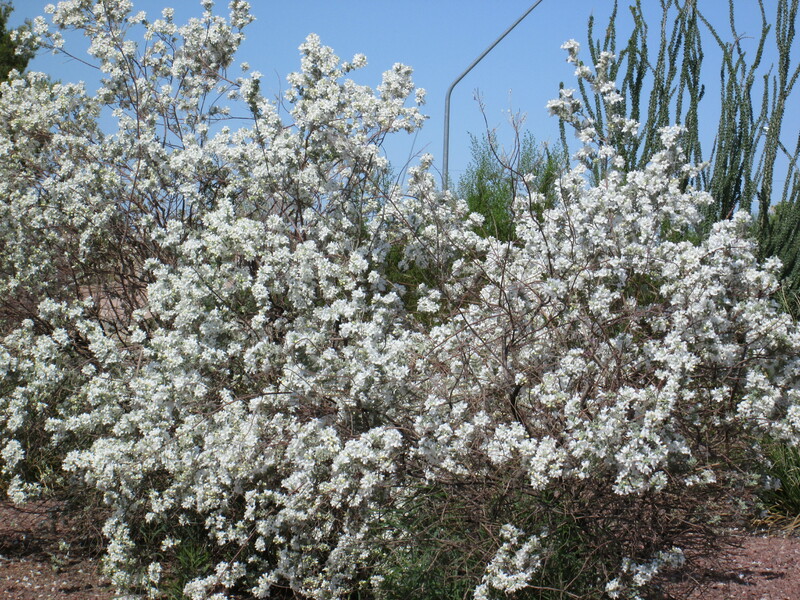 The White flowering species of Texas Sage is called White Cloud and is a heavenly white bush that blooms commonly throughout Arizona and adds dazzling color to any garden. 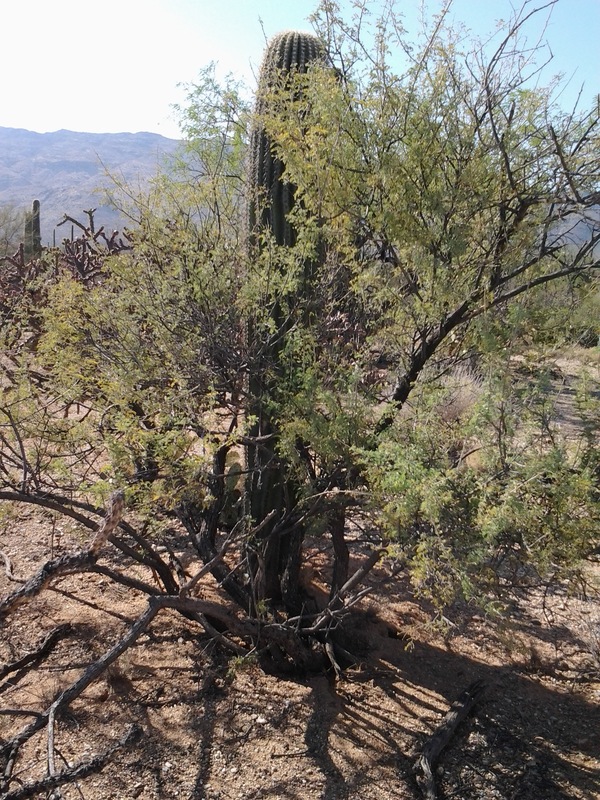 In the above photo you will see an Ocotillo Cactus standing tall behind the white flowering bush. 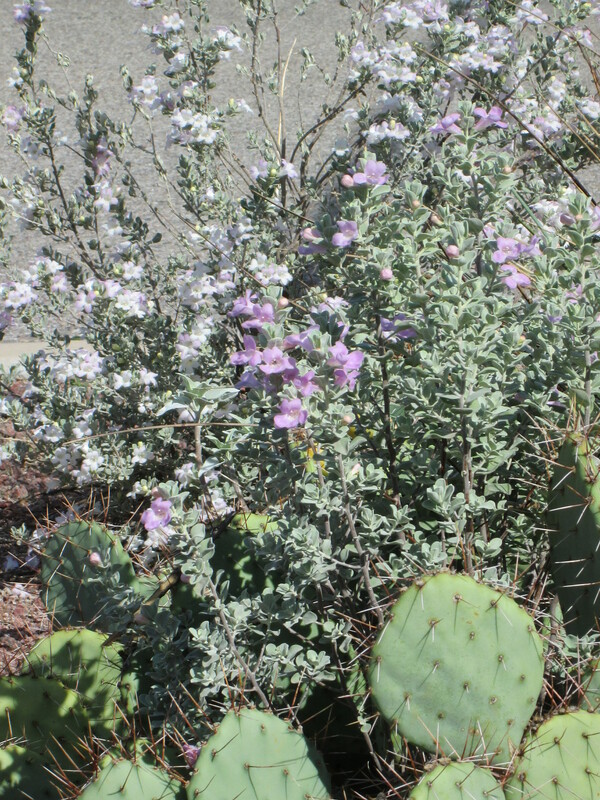 This White Cloud Texas Sage shrub could be trimmed; therefore creating a contrast between the magnificent Ocotillo cactus and the white blooms. 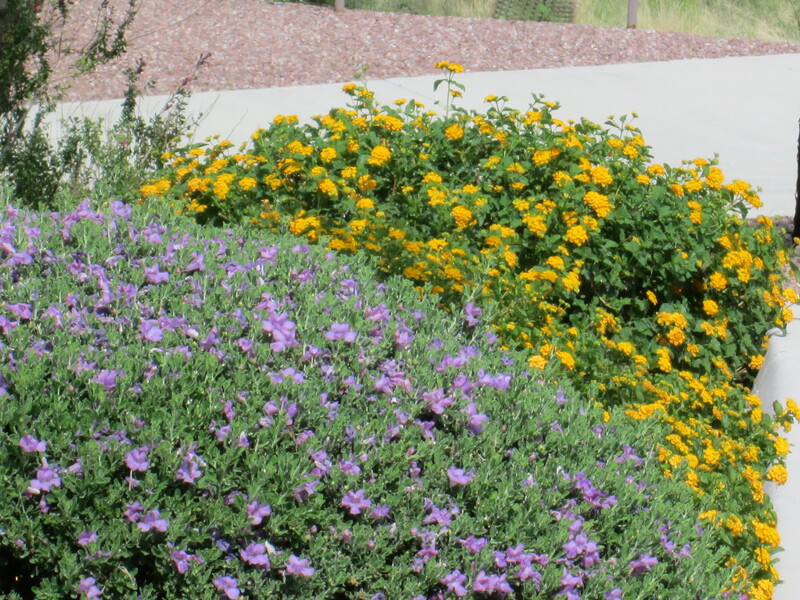 Texas New Gold Lantana and Purple Texas Sage are considered two of the best drought tolerant, easy care, heat resistant, flowering desert plants in Arizona, California, etc… The yellow lantana mound looks dazzling next to a well pruned purple sage shrub. Pictured above is part of the xeriscape area of our yard. Cacti come in a variety of shapes and colors. Some species of cactus have glorious flowers that bloom in the summer. 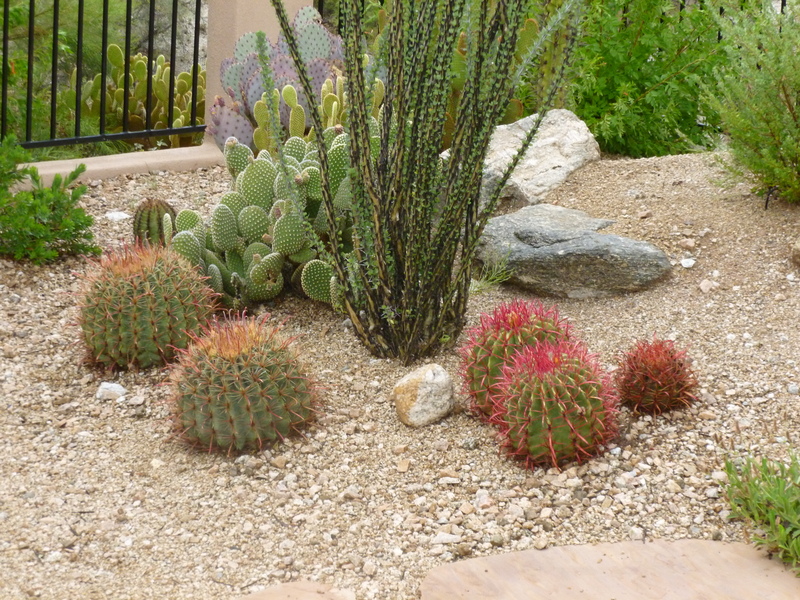 Grow a flowering desert plant, bush next to a cactus to create a beautiful desert garden. 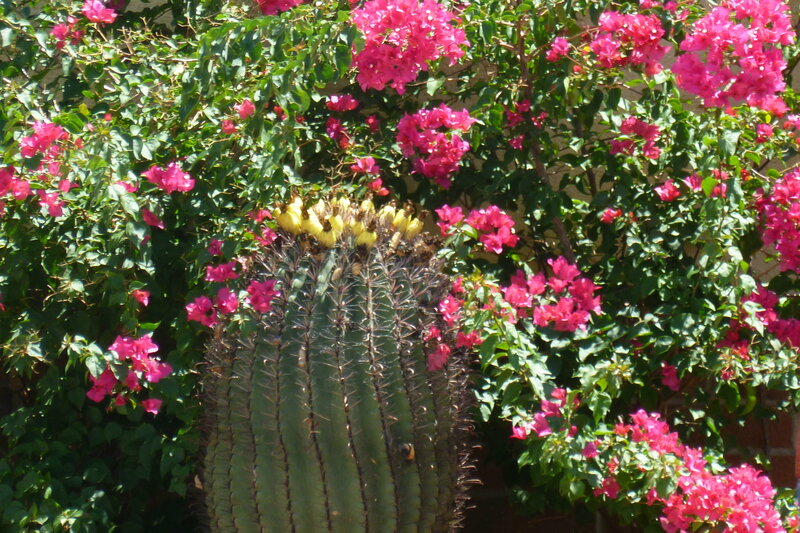 The Bougainvillea shrub looks amazing next to a barrel cactus in the picture below. 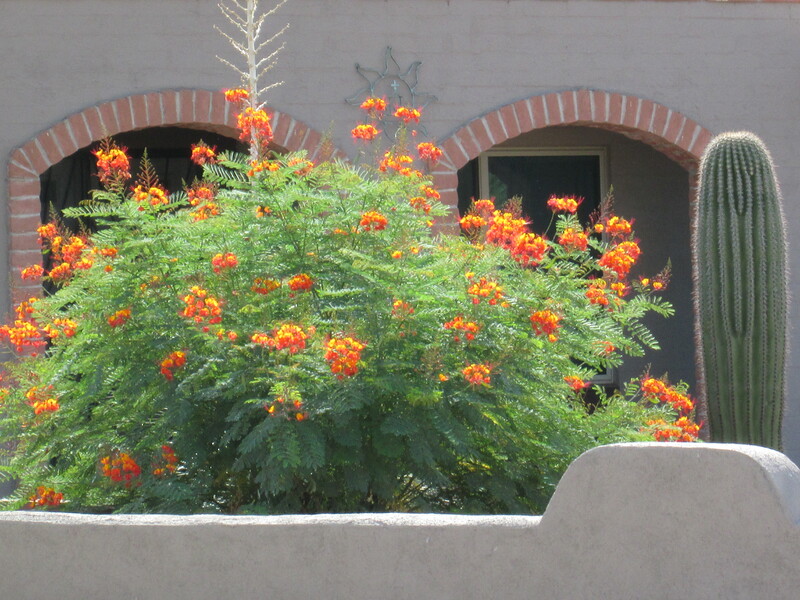 Red Bird of Paradise plant is the best choice for orange, red and yellow flowering bushes. Add a Saguaro cactus next to your desert shrub to create an unique design. Pictured below is a common Arizona Wildflower called White Stem Paper Flower. 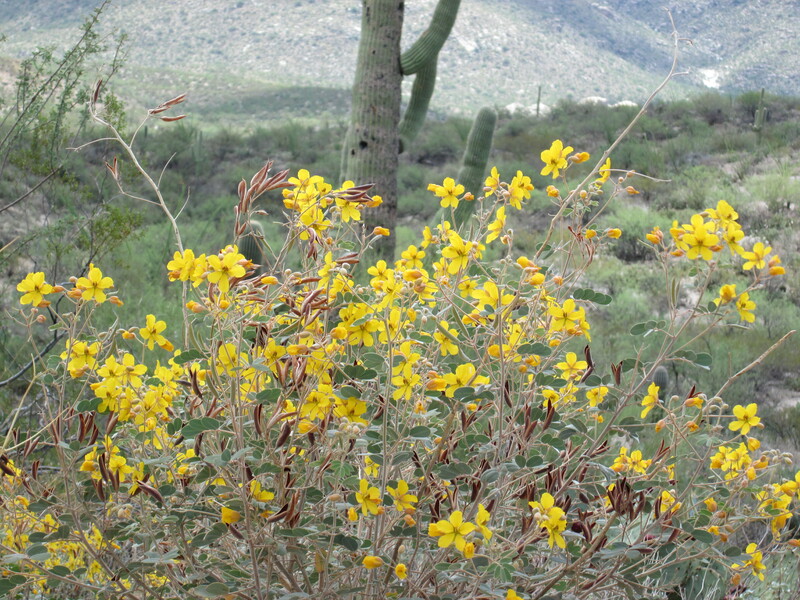 During Arizona Monsoon, (rainy season) the wild flowers paint the desert and many desert gardens. Paint your own desert; the choices are endless! This weeks rain invoked shrubs with purple flowers everywhere. Arizona’s most popular perennial, drought resistant, desert shrub is the Purple Texas Sage or sometimes call Texas Ranger Plant. 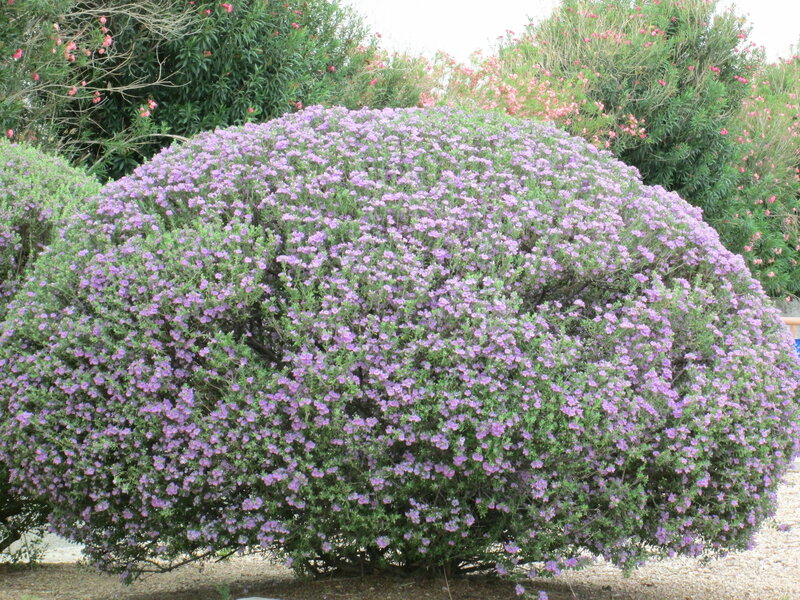 Texas designated Texas purple sage (Leucophyllum frutescens) as the official state native shrub in 2005. 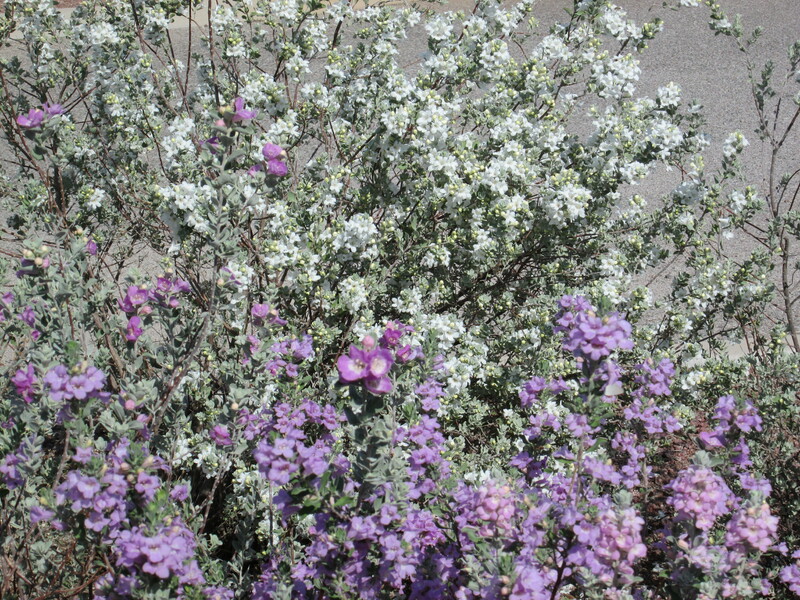 The Texas Sage desert shrub is sometimes referred to in Phoenix, Arizona as Purple sage. While driving through the city of Tucson, Arizona I came across a field of purple, red, orange, and yellow blooming bushes. 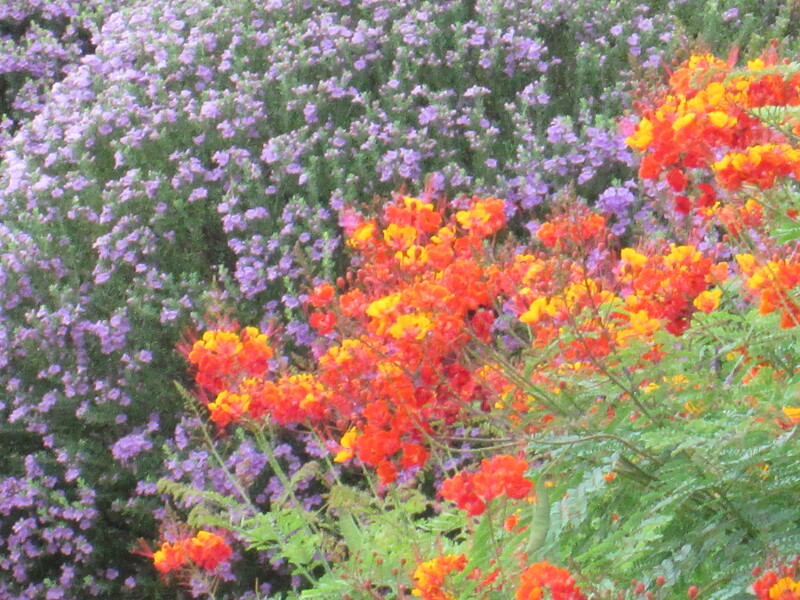 The picture above is a Texas Ranger Plant, purple texas sage, next to a Red Bird of Paradise desert plant. What a perfect combination of two of the best flowering drought tolerant bushes available. This gray leafed desert shrub adds interest to your garden even when it is not in bloom because of the color of the evergreen leaves. 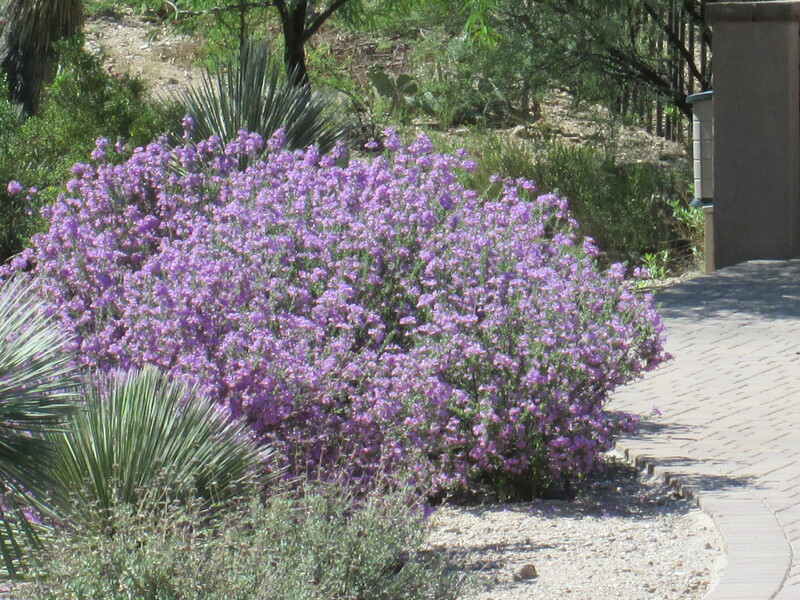 Purple Texas Sage is deer resistant, heat resistant, drought tolerant and a good choice for xeriscape gardens. Watch for purple blooms from May through October. Your Purple Texas Ranger Plant does best with full sun. 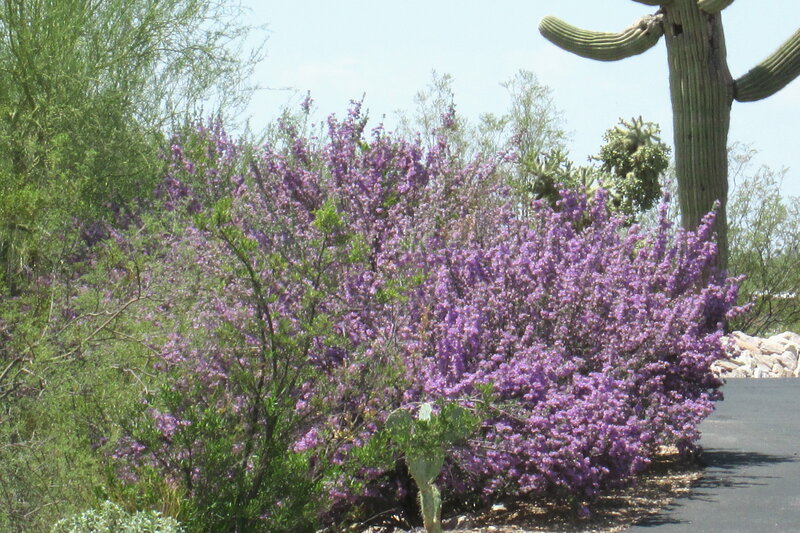 This Purple flowering bush is a very hardy desert plant with low maintenance and is easy to find. Those beautiful dazzling purple flowers, pictured above, will come out after rain or when it is humid. You can also encourage flowering by giving them extra water. Let the ground dry out between waterings so you do not cause the roots to rot. The main challenge for your Purple flowering desert bush is the fact you will want to prune them to keep your Purple Sage plant looking neat. So if you want to trim your purple sage shrub into a hedge just remember – the best time to prune your purple Texas Sage is when it is NOT flowering. It is best NOT to trim it when the purple flowers are in bloom.